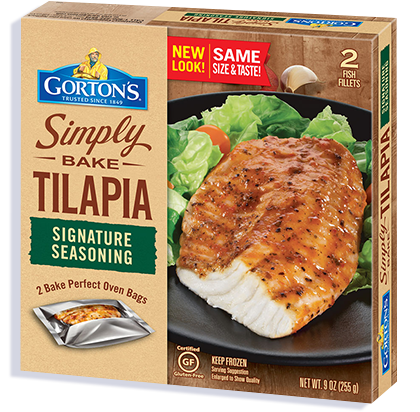 Flaky Tilapia fillets with chef inspired seasoning. Preparing restaurant-quality, chef-inspired seafood is a snap with our Simply Bake Tilapia. Get all the taste and none of the mess with the Bake Perfect Oven Bags, which lock in flavor for a delicious and perfectly cooked meal, every time. Water, canola oil, salt, spices, modified corn starch, dried garlic, dried red bell pepper, maltodextrin, corn starch, paprika, xanthan gum, onion powder, parsley, natural flavor, citric acid, garlic powder, sugar.